The summer lunch program in Salina begins this week. 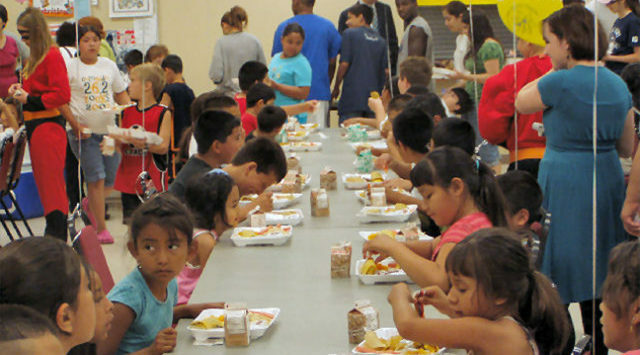 Each summer USD 305 serves free lunches for anyone 18 or young. Anyone over the age of 18 can eat for $3.50. Last year over 3,900 breakfast and over 25,000 lunches were served in Salina. USD 305 Food and Nutrition Services Director Cindy Foley says they hope more children will come in this year “There’s a lot of children that could tale advantage of the program that we want to reach,” she said. This year South High School has been added as a serving location. All sites except Cottonwood will serve a free summer lunch from 11:30am to Noon, Monday through Friday. Cottonwood and South High will serve free lunches from 12-12:30 p.m. No meals will be served on Friday, July 4. Breakfast will be served only at the Cottonwood site from 7:45-8:15 a.m. June 2 through July 3. Breakfast price for adults is $1.75. There is no fee or registration required to receive meals. During the 2013 summer program, 3,925 breakfasts and 25,695 lunches were served to Salina children at eight open sites and one enrolled site.